I was in Providence this past weekend. There was a Water Fire event in the downtown. Rows of pillars run down the center of the river. On top of each is a brazier, a holder for logs. After dark, staff light the logs and huge loudspeakers project music. 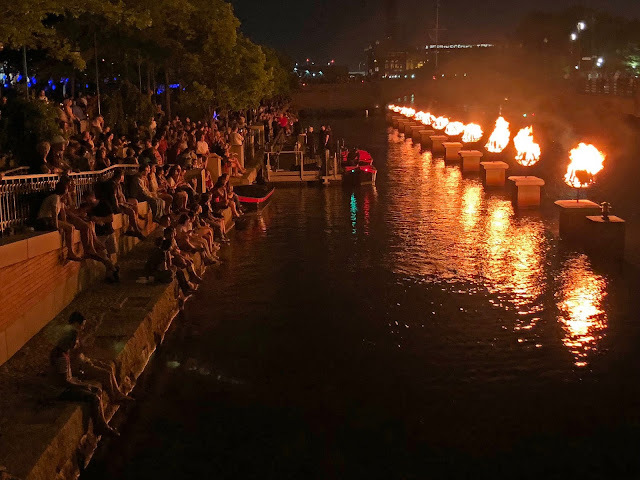 Water Fire is a popular event. The river banks and nearby parks are full of people. Great fun. Fascinating to see a sight like this in the dark of the night. It looks very dramatic, Jack! Seems like a great event. Do the authorities have to pull many people out of the water? Fine night photo. Wow, what a cool event. Water Fire? That's new to me. Very dramatic! Are the pillars permanent, or just placed there for the event?